When I want to treat myself too a relaxing day as a reward for a long week of work, a few essential activities come to mind: a facial, a bubble bath, a fancy meal for one and of course a manicure! That said, when you're an intern on a non-existent wage and/or a student, regular visits to the salon to get a professional manicure is simply not feasible. And to be honest, even if I had the budget, I'm not sure I'd have time to make such frequent visits! Working in a professional environment it's important to always been well groomed and looking your best, even if you are not in a client facing position. At any given time you may be introduced to someone new, maybe even a manager or executive and almost 99% of the time you'll be greeted with a handshake. You do not want your tailored outfit, perfectly set hair and glowing make up to be tarnished by chipped grotty nails! This sounds so obvious but I cannot tell you the amount of times I've witnessed this first hand. It's more distracting than you would you care to think. 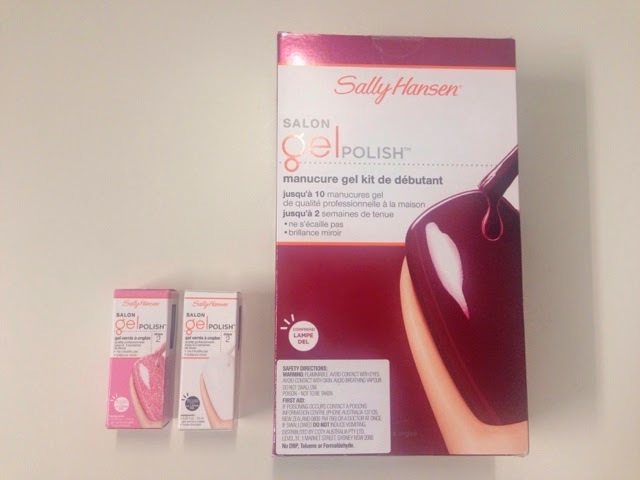 That is why Sally Hansen's new Salon Gel Polish system caught my eye. The idea that I could give myself a gel manicure in the comfort of my own home, whenever I happen to have 15-30 minutes to spare was music to my ears. Top that off with a promise of no drying time and up to two weeks wear and I'm sold! Whilst treating yourself once in a while and making a sneaky splurge here and there is important, if I can find a more affordable way to unwind and pamper myself at home then I'm all in! The Starter Kit ($99.95 @ Priceline) has everything you need to get you on your way, LED light, base and top coat, a nice dark red polish to get you started, nail cleansing pads...all that good stuff. Don't worry, the basics can be easily replenished in store in a nifty little pack ($29.95 @ Priceline). Get on it. These babies have lasted on my nails for nearly three weeks! No chips. No nail breakage. You would not believe how long my nails have grown with the gel protecting it. Commitment issues? Don't want to stick with one colour for three weeks, no matter, just paint over the gels with any regular nail polish you fancy. Be as fickle as you like because nail polish remove won't affect these bad boys at all. In one sentence? I'm sold. Read the instructions and follow it. Seriously. I know the excitement and adrenaline is telling you otherwise but trust me, you'll thank me later. The Starter Kit came with Wine Not, I wanted the one with Shell We Dance, they didn't have stock. I settled. I've yet to try it but my mother has and it's pretty, bit shimmery but a lighter wine than I prefer. I'm a neutral or dark and vampy sorta girl, brights in-between aren't really my thing but that's okay. I have been obsessed with white nail polish for an unseasonal amount of time. 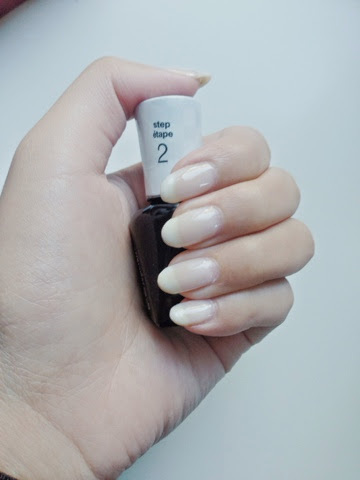 Done right, it's so chic and doesn't at all resemble stationary white-out on your nails. So White Away was a given to be purchased with the Starter Kit. But it's sheer, milky even but nonetheless sheer. So sheer it just looks as though I have gel and no colour on my nails. That's not ideal and I'm disappointed. So it's not what it says it is on the box, but I'll make do. This can be a useful because it doesn't disturb the colours of any other regular nail polish I may paint over.